IN this series’ teaser and in part one we focused on Benoît Battistelli’s professional relationship with Largarde, who is known for serving foreign (mostly US and/or corporate) interests inside Europe. This echoes a lot of what we are seeing in the EPO these days and we shall cautiously proceed before getting to the ‘meat’ of the story. There is some background which needs to be presented. In this series we are presenting just facts, which we carefully verify and check with various sources. Where there is doubt or uncertainty we will present it as such and always attribute where possible. We don’t want to go ad hominem; we leave that to Battistelli himself. As a new comment put it last night, at Battistelli’s EPO “Control Risks were hired to prepare the charge-sheet and the barristers were hired to plead the case” while another person correctly noted that “At the European Patent Office, you do not get a working contract.” It’s no man’s land. It’s effectively operating outside the law and there is no genuine due process. “There is some background which needs to be presented.”The EPO does not want the public to think that it has legitimate critics. It defames the critics. There are only ‘armed’ ‘Nazi’ ‘Mafia’ ‘snipers’ exposing EPO abuses, or so we’re supposed to think. Last year the EPO personally attacked at least 2 critics (staff representatives), possibly defaming them in the process. This year it has done so to more than 2 people, so it is only getting worse. The EPO will sooner or later try to discredit reporters as well (probably pile more ‘dirt’ on them), just as it does to everyone ‘daring’ to expose the EPO. That’s just the modus operandi du jour. Today we’re going to drop the “Rothschild” word/name, which often gets wrongly associated with all sorts of conspiracy theories. What we actually allude to here is an affluent French family whose relevance to the story will become apparent in future parts of this series. The following toasting photo shows Largarde in her then role as French Minister of Agriculture and Fisheries toasting with Baroness Philippine de Rothschild at Vinexpo, the world’s biggest wine fair, 18 June 2007 in Bordeaux, southwestern France. “The EPO does not want the public to think that it has legitimate critics.”Baroness Philippine de Rothschild was the owner of the French winery Chateau Mouton Rothschild. 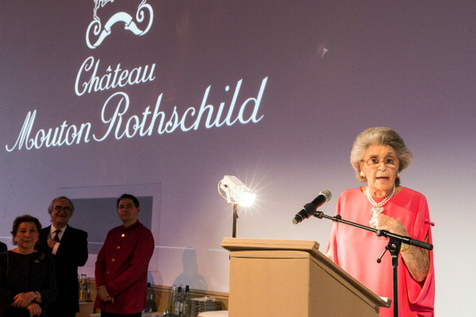 Here she is shown delivering a speech during the dinner of Conseil des Grand Crus Classes of 1855 hosted by Chateau Mouton Rothschild on June 16, 2013 in Pauillac, near Bordeaux, France. “We note in passing that her adopted son Alain Pompidou was a former President of the EPO.”As might be expected, Baroness de Rothschild was well-connected in French high society. Here you can see her with Claude Pompidou, the widow of former French President Georges Pompidou. More information about Claude Pompidou can be found in Wikipedia. We note in passing that her adopted son Alain Pompidou was a former President of the EPO. Seeing some circles yet? Baroness de Rothschild was closely associated with a charity operated by Madame Pompidou (“Fondation Claude Pompidou”) which issued a statement of appreciation following her death in 2014 (in French). “It’s not about what you know but who you know and who likes you.”Needless to say, as the owner of Chateau Mouton Rothschild, Baroness de Rothschild was also a significant player in the French wine industry. This will be the ‘meat’ of our story, as we shall come to at a later stage because it involves Battistelli.